These crazy/wacky uses of duct tape are from our Duct Tape Books, and our 365 Days of Duct Tape (page-a-day calendars), by Jim and Tim, the duct tape guys. Note: these hints are for humor and amusement purposes only. Duct tape in the wrong hands can be a dangerous weapon. Use your head, duct tape with care. We will be adding to this page regularily, check back often! 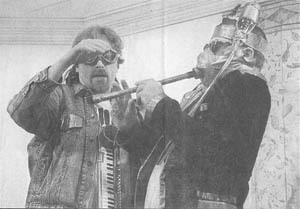 Here Jim and Tim demonstrate how an ordinary toilet plunger, duct taped to your face, gives you an extra "hand" to hold those spring-loaded faucets in the "on" position while allowing you to put both hands under the running water. (The gizmo on Jims head is a nighttime jogging hydration device.) Photo by Ana Venegas, The Orange County Register. Click here for the bizarre story of duct tape abduction that happened to this Iowa bachelor. End that age old argument! 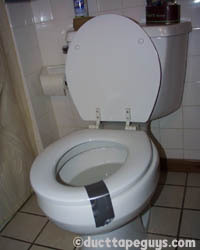 Because duct tape is gender neutral, may we suggest that gals can end that age old argument by duct taping the toilet seat down! Yes, you may grab this and e-mail it to your friends, but you MUST link it to www.ducttapeguys.com - thanks. One of the our largest undertakings during our Tape the World, World Tour was (and still is) doing a duct tape tuck-pointing job on the Great Pyramids of Egypt. Shown here, weve just completed the two smaller pyramids. 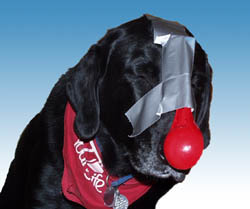 A red ice cream scoop and some duct tape can get your dog into the holiday spirit and dressed up to guest in the school Christmas play. Think these uses are wacky? Wait until you check out Duct Tape Bizarre! Wacky Uses from REAL People! Speaking of Wacky Uses... click the ticket stub on the left. Gary in Minneapolis, Minnesota once used duct tape to secure a board five feet outside of his third-story apartment so he could barbecue outdoors. Good one, but don't try this at home, kids. If for some reason the board breaks, your downstairs neighbors might think it's raining fire and brimstone! Always make sure you have a roll of duct tape with you when you travel - you never know when you are going to loose a quarter panel. And, when you aren't using it to fix stuff, a roll of duct tape duct taped to the dashboard of your car makes a great pop can holder! C'est Le Tape du Duct! Our Duct Tape Guys Tape the World, World Tour brought us to many exotic places (all pictured in Duct Tape Book Two - Real Stories). Shown here, we have just finished putting duct tape walls on the Eiffel Tower - now the Parisians have a lot more rentable space. - It's hard to be humble when you're a Duct Tape Pro! Ya, now we're almost as popular in Paris as Jerry Lewis! Duct Tape and Jim and Tim save the Alamo from further erosion and preserve it for future generations to explore.